Knitted brows, eyes glued to the phone, the thumb slowly scrolling down through pages on the phone display when suddenly the sound of one’s stomach breaks the tension with the growl of hunger. At lunch time, many Sookmyungians ponder the question, “What should I eat today?” With the thought of going somewhere new to eat but fearing the food at new restaurants, students look to others’ recommendations for possibilities. To help Sookmyugians make better decisions, The Sookmyung Times explored restaurants and cafés located near Sookmyung Women’s University. Like the Guide Michelin, a famous star ranking guide to restaurants around the world, the Sookchelin Guide is based on Sookmyugians suggestions, created by Sookmyugians, and for Sookmyugians. Below is the guide to the best restaurants near Sookmyung. Bon Appetit! When Koreans meet others, after initial salutation, they usually ask, “Did you eat?” They also typically end a conversation with, “Let’s grab a bite together soon.” In other words, food is an important part of Korean daily life. Near Sookmyung Women’s University are a number of restaurants and cafés loved by Sookmyungians. To learn more about Sookmyungians’ preferences, SMT conducted a survey on restaurants and cafés near the school from October 16 to November 1. A total of 76 Sookmyungians participated in the survey. Out of the 76, 30 (39.5%) said they visit a restaurant or café on an average of once a day, 26 (34.2%) said at least twice a day, and 10 (13.2%) for three times a day. Also, 5 (6.6%) eat in front of school more than four times a day, and the same number applies to those who don’t eat near school at all. Overall, at least 93.4% of respondents visit restaurants or cafés at least once a day. Then, what factors help decide which places to go? As expected, most placed taste as their top priority (66 votes, 86.8%), followed by reviews of fellow Sookmyungians (44 votes, 57.9%), and cost (38 votes, 50%). At the bottom of the list were sanitation (13 votes, 17.1%), solo dinning capability (10 votes, 13.2%), and customer service (6 votes, 7.9%). Some even gave more opinions besides those on the survey such as nutrition and waiting time. Also, SMT asked respondents to recommend two restaurants and two cafés they take visitors to Sookmyung because they felt these eateries were the most cost-effective. The top 5 most recommended restaurants were MASI & BASI (39 votes, 51.3%), Pho36 St (19 votes, 25%), WOW Sinnaetteok (18 votes, 23.7%), Jangbass (13 votes, 17.1%), and GGgo (8 votes, 10.5%). The number of votes for MASI & BASI far outweighed others. In terms of cost-effectiveness, the 5 most satisfying restaurants were GGgo (25 votes, 32.9%), Arirang Rojum (20 votes, 26.3%), Ttowatto (14 votes, 18.4%), WOW Sinnaetteok (12 votes, 15.8%), and Pho36 St (11 votes, 14.5%). Interestingly, both GGgo and Arirang serve their meals in disposable cups. 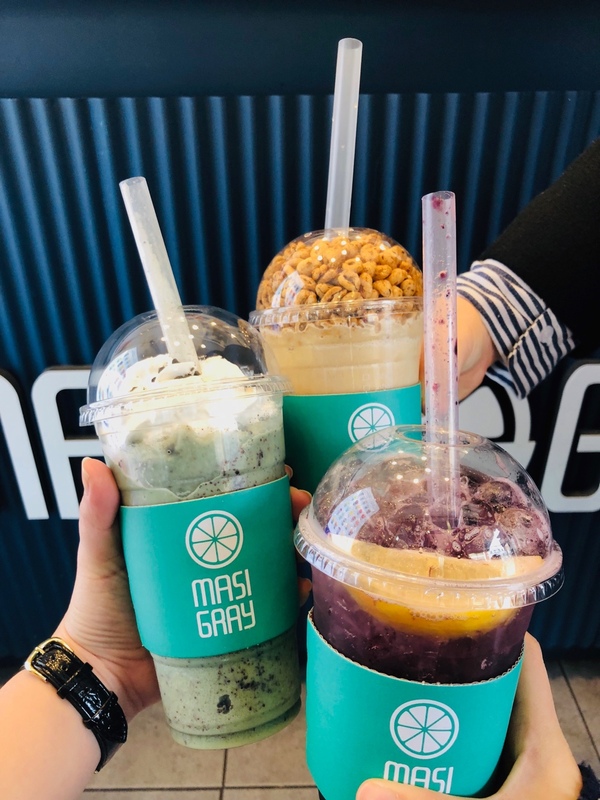 The top 4 dessert cafés Sookmyungians take visitors to were Han-Ib Macaron & Ice-cream (26 votes, 34.2%), Oppa Egg Bread (23 votes, 30.3%), MASI GRAY (13 votes, 17.1%), and Waffle House (11 votes, 14.5%). Monster Place and Cheongpa Mansion both took fifth place at 10 votes each. Considering cost-effectiveness, the top cafés from the survey were Dding Ddong Waffle (28 votes, 36.8%), Oppa Egg Bread and MASI GRAY both placed second (18 votes each 23.7%), followed by Han-lb Macaron & Ice-cream (14 votes, 18.4%), Myeongrang Hotdog and Bonsol Coffee (10 votes each, 13.2%), and Monster Place (8 votes, 10.5%). SMT reporters decided to visit the recommended places. At first, a reporter visited GGgo because it took top place in terms of cost-effectiveness. Most Sookmyungians will have likely eaten at GGgo at least once. The reporter ordered Nice Rice level 1 with a topping of extra regular cheese. The cost of each item on the menu has risen since September of this year, so Nice Rice now costs 4,000 won, but with the additional topping of cheese costs, it cost 4,500 won. Anyone who cannot stomach spicy food should order the item at a mild level of spiciness, and the ordering of a topping will also reduce the level of spiciness. Nice Rice is fried rice with katsuobushi, crunchy cabbage, squid, and shrimp. The combination of seafood and spicy sauce is really delicious. It’s actually salty and spicy, so it is very addictive. Eating just the single cup of Nice Rice is enough to make one feel full. However, the eatery itself is quite small, so those waiting for a seat will wait for a long time. To ensure a fast order and no wait, it is best to place a pickup call. The food is quite delicious but the kitchen counter faces the street, so anyone worried about sanitation, please keep this fact in mind. Considering all the factors, reporter gives GGgo a rating of 4.6/5. For someone seeking a milder flavor yet cost-effective meal, Arirang is a good alternative. Arirang closes every Sunday. The interior of the shop is narrow but it does have a little more space than GGgo. At Arirang, reporter ordered Tofu Rice, which is a cup of rice, tofu, chives, laver, and soybean paste. The food is served quickly and the cost of Tofu Rice is 3,500 won. While many enjoy the taste, reporter felt the dish was a bit salty. The single cup of rice was not enough to satisfy reporter hunger, and she wanted dessert. However, compared to its cheap price, SMT reporter gives this restaurant a 4.5/5. Finding a cost-effective restaurant in front of the university is fairly easy, but it is harder to find nice place to eat when you wish to spend time with visitors like family or friends. Survey results indicate that the most popular place to take visitors is MASI & BASI. Those considering going to MASI & BASI should be aware of its operating hours. So check it from restaurant’s official Instagram account (@masibasi3855). MASI & BASI is also closed every Sunday. Space in the shop is limited, and seats are restricted to a maximum grouping of 4 people. Reporter and her friend ordered White Kimchi Cream Pasta (12,000 won), Chicken from China (17,000 won), and Sotonic Set (One bottle of Soju + Two bottles of Tonic Water + Lemons, 9,000 won). Among the menu items ordered by reporter, the tastiest dish was the chicken. Its sweet and sour sauce, fresh vegetables, and red chilies made the crispy fried chicken extremely tasty. Alcoholic beverages with a taste of lemon were also satisfying. The mood was cozy. The score for this place is 4.8/5. Pho36 St also came highly recommended. It is a Vietnamese restaurant closed every Saturday. Most tables are designed to accommodate two people, but there is one table of 4. For groups of 3 or more, it is not a good place to gather. With a preference for cutlet, reporter ordered Tenderloin Steak Pork Cutlet (8,000 won). The food was served fast despite the large number of customers in the shop. The cutlet was delicious. The thick slice of meat was warm, the batter was crispy, and the sweet and sour sauce was fabulous. Compared to other cutlet restaurants near the front of the school like COBACO and Brown Pork Cutlet, the cutlet at Pho36 St was better. At first glance, the amount of food looked insufficient, but upon completion of the entire meal from rice to salad to meat, reporter was full. The restaurant is given 4.7/5. If you are still feeling hungry after a meal and want something sweet for dessert, we recommend going to a dessert café. According to the survey, the two most popular places to take visitors for a treat were dessert bakeries and cafés. The two most popular of each kind were ‘Han-Ib Macaron & Ice-cream’ and ‘Oppa Egg Bread’. At Han-Ib Macaron & Ice-cream, there is a wide selection of macarons such as Earl Grey, Injeolmi, Red Velvet, Salty Caramel, Oreo, Crème Brûlée, Nutella Malcha, Dwaejiba Ice-cream, and Cheese Cracker. After tasting each type, SMT recommends Earl Grey and Injeolmi. Earl Grey is similar in taste to cookie and cream ice-cream, but still has the delicate flavor of earl grey, so even those who do not enjoy black tea will surely like the taste. Injeolmi macaron tastes the Korean traditional rice cake powdered with soybean flour, so its taste is a very sweet nutty flavor. Each macaron costs 1,500 won, so they will not be too much of a burden. However, since the shop’s actual space is small and there is often a long queue to purchase items, you had better make a pre-order by calling the shop. Total Score: 3.8/5. Next, at Oppa Egg Bread, there are two simple menu items, namely Shudal and Mayo Shudal. Both have similar ingredients, but Shudal has ketchup spread on it and Mayo Shudal has mayonnaise spread on it. The egg bread is about the size of one’s palm and costs 2,000 won. While some may say the price is quite expensive compared to the size of the bread, the bread is filled with various kinds of chopped vegetables, and you are served the bread as soon as it comes out of the oven. Furthermore, the shop is open until about 10 p.m. and the owner is very kind, so customers are not only served warm bread, but also the warm heart of the owner. Total Score: 4/5. The two most cost-effective cafés recommended by Sookmyungians were ‘Dding Ddong Waffle’ and ‘MASI GRAY’. At Dding Ddong Waffle, there are more than 60 items on the menu to choose from, and customers are also given the chance to add additional toppings and syrup. This SMT reporter recommends two specific types of waffle. The first is the original basic waffle, number 5 (Plain) or 27 (Cacao Waffle + Whipped Cream + Apple Jam). For people who don’t like whipped cream, options 15 or 35 would be better choices for you since they contain yogurt ice-cream instead of whipped cream. If, however, you would like to indulge in a very sweet waffle, this reporter recommends number 25 with the added topping of whipped cream or caramel syrup and chocolate chips. 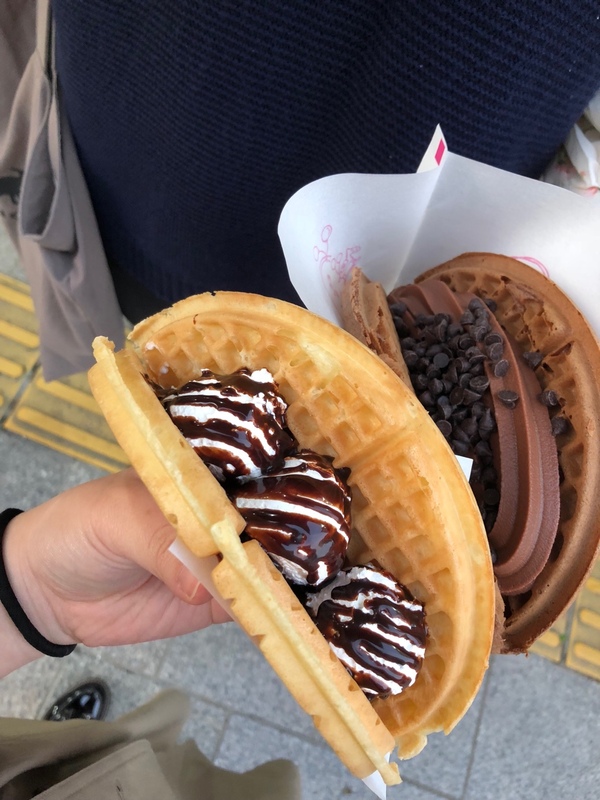 All waffles mentioned above cost less than 4,000 won. Moreover, with ice-cream being a popular treat among Sookmyungians, Dding Ddong Waffle is not a place to be missed. Most importantly, it is very reasonably priced for the amount of food, which will surely satisfy your taste and not hurt you too much financially for anyone on a budget. Total Score: 4.7/5. Second, many Sookmyungians on the survey recommended MASI GRAY, a café that is also frequented by this reporter. The greatest strength of this café is that it adds less ice to its drinks than other establishments. Also, if you like minty flavored drinks, this SMT reporter highly recommends the Mint Choco Frappe. It is a drink made with grounded ice and mint chocolate cookies and gives its drinker a truly refreshing taste of mint. A venti sized drink costs 3,800 won and regular sized drinks cost 3,300 won. Another pleasure is that the attitude of café clerks is warm and comforting. They are not only kind, but also cheerful, and they never lose their smile. This reporter is sure that a visit to the café will make you feel alive and energized. Total Score: 5/5. Lois McMaster Bujold once said, “If you make it plain you like people, it’s hard for them to resist liking you back.” There are many restaurants and dessert cafés around Sookmyung Women’s University, but in the minds of Sookmyungians, there is always that one single place they like best. What is common to all recommendations? Everyone seems to want one commonality, and that is love for customers from staff and owners. Customers will always flock to places where they sense they are loved. SMT reporters hope this article leads to more than the passing of information, but connects merchants and Sookmyungians.